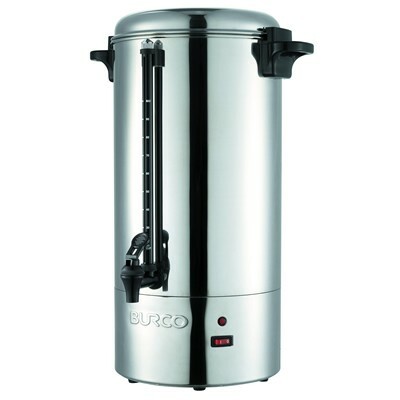 Our Commercial Manual fill Coffee Perculator is ideal for meetings, functions rooms etc. 1 Remove the lid by rotating so that the retaining lugs slide out from the handles. 2 Pour cool water into the urn to the desired level as seen in the water level indicator (minimum 25 cups). These are rough guidelines only and should be adjusted to suit the coffee used and strength required. 5 Slide the basket tray (4) onto the percolator tube and place inside the urn making sure that the foot of the tube is positioned centrally in the well. 6 Slide the filter basket with cover onto the percolator tube then replace the urn lid. 7 Plug the mains cable into the mains supply and press the power switch (12) to ON, the lamp in the switch will light up. 8 When the coffee ready neon (9) ‚ lights up, the brewing process is complete. The coffee will be kept at the correct temperature and coffee can be served. The tap has two positions – one, self closing for smaller amounts the other self holding for continuous pouring. 9 When there are only about 3 cups left in the urn, press the power switch to OFF and unplug from the mains supply. WARNING Disconnect from the mains supply before cleaning and allow the coffee percolator to cool. IMPORTANT Do not use any abrasive cleaning fluids or materials. 1 Wash out the urn. Use clean water and a soft cloth. 2 Brush any scale or sediment from inside. 3 Rinse thoroughly. The water level indicator can be removed for cleaning by unscrewing the caps top and bottom.